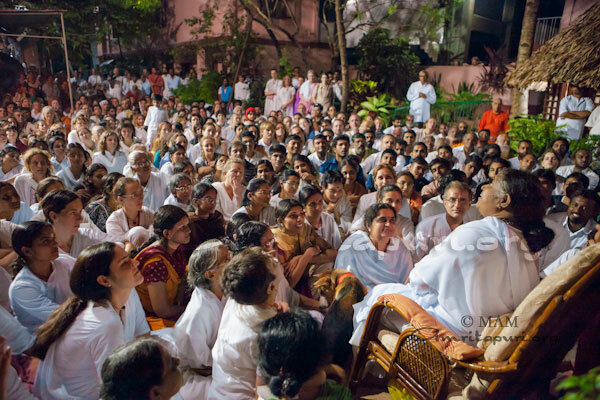 On Saturday, before leaving for her world tour, Amma had satsang with the asramites. 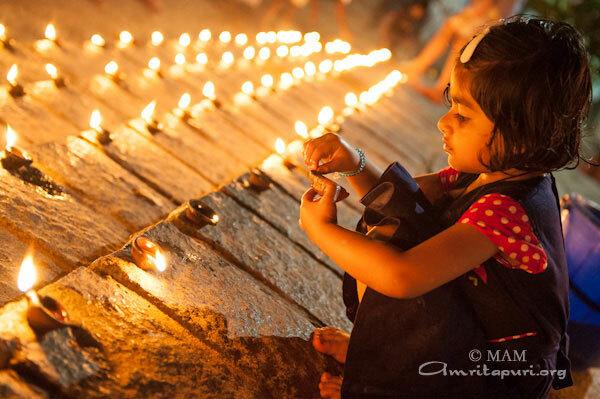 She sat with all the ashram residents in the Kali temple, advising one and all by answering their questions. 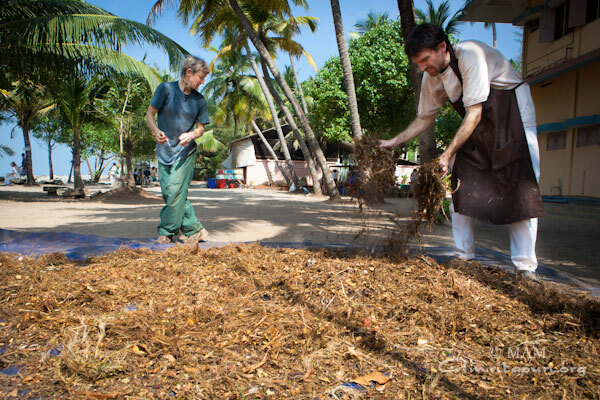 After that, Amma announced that she would come out again later to make dosas and french fries herself for everyone. 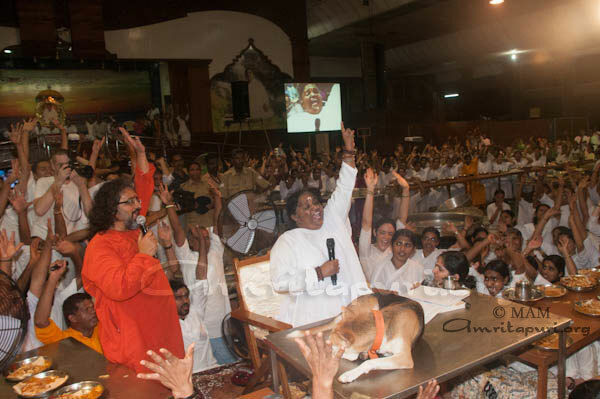 Right after the evening bhajans, Amma came down from the stage into the main hall. She started slicing potatoes and soaking them in water to make the fries. 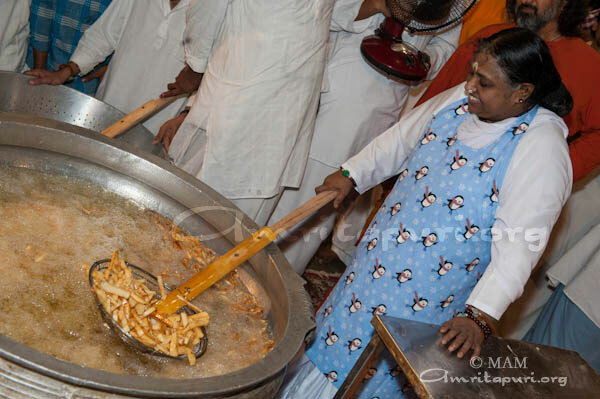 Amma then took a huge basket of sliced potatoes and started frying them. When she put the first set of potatoes in to the oil, there was big round of applause form all her children. 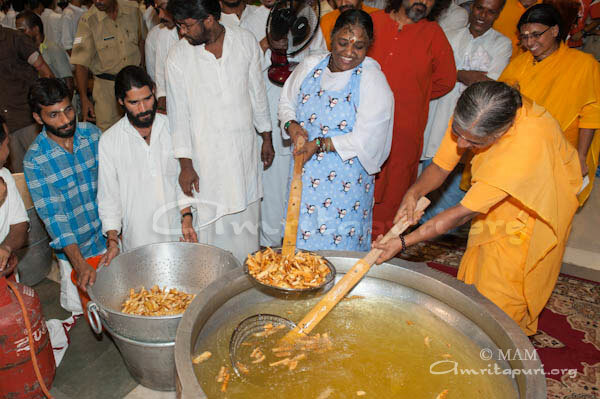 After turning the potatoes over few times, she took a sample and asked Swamiji to taste them and see if they were ready. After frying them for a bit more she had her first basket of fries ready. 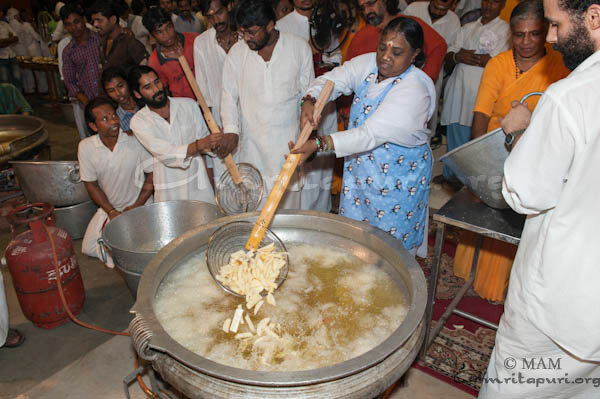 Several baskets were then started by others simultaneously at other fryers while Amma continued to fry. 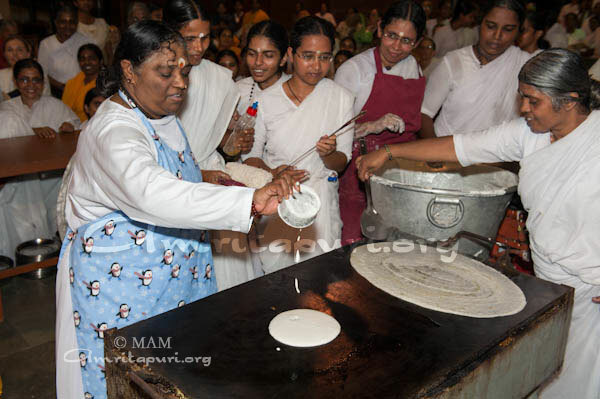 Amma then went on to the dosa grill and started spreading the dosa batter and flipping them when ready. 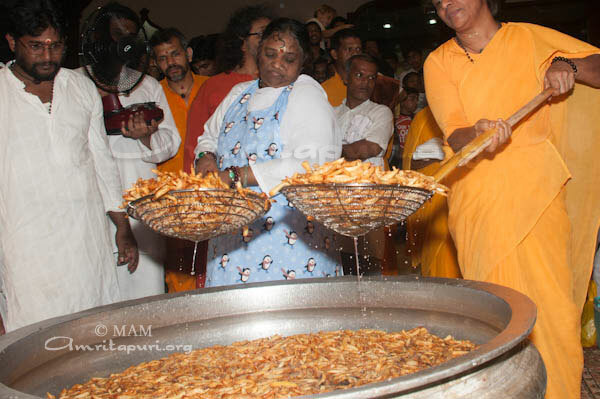 Within 45 minutes, Amma started handing out plates consisting of a dosa with sambar and some french fries. 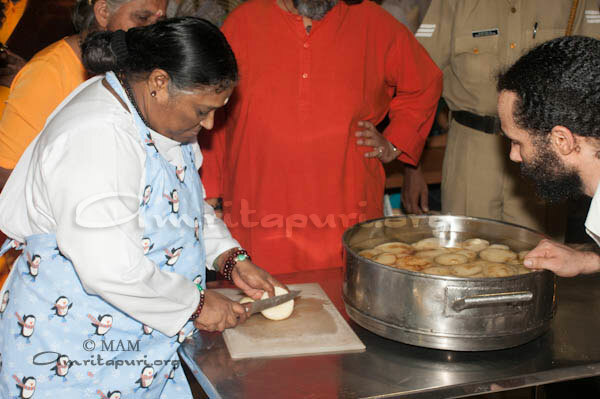 Some volunteers continued making dosas and french fries while others helped Amma serve the plates. Several students even helped themselves to 2 or 3 plates to fill their appetites. Seeing this, Amma called out saying “Children, if you must take a second dosa, do it after some time so everyone will get their first one and not french fries as we may not have enough for everyone to have a second serving.” After everyone chanted the 15th chapter of the Bhagavad Gita, Amma led the “Bramharpananam” prayer. Now it was time to eat. Amma picked up a big dosa and displayed its massive size to everyone. It was almost 2 feet in diameter. After taking a very small piece, she passed it on for all to share. 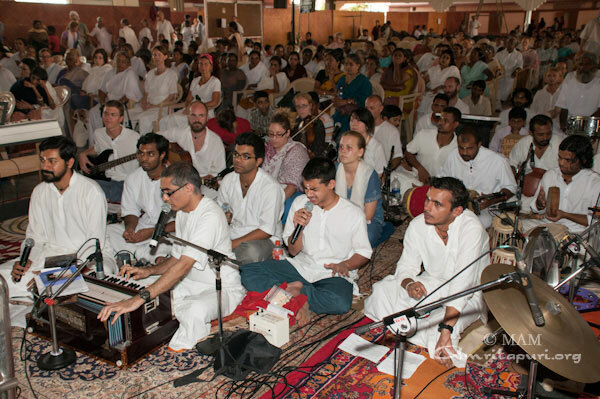 After the food, Amma led everyone in singing. 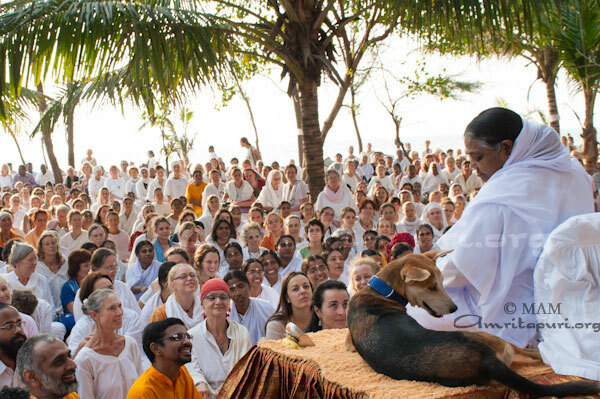 Suddenly Tumban, the ashram dog came barking. Amma started calling out “Tumba, Tumba”. 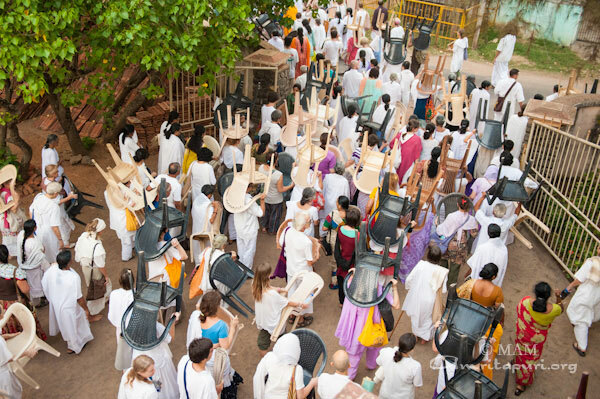 Tumban then came running to Amma weaving his way through the crowd. 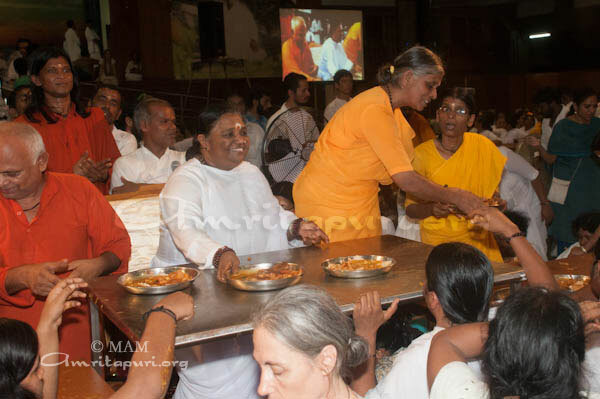 Seeing there was no place for him to sit anywhere near her, Amma pointed to a place for him on her table. And lo! 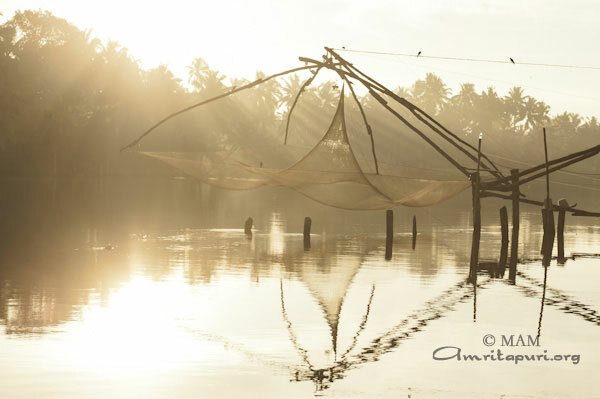 he jumped to where Amma had indicated and turning his head towards her, lay down. Amma sang “Bandalo, Bandalo” and as she sang she swayed to the music. The main hall was in cheerful elation as everyone sang and clapped with each other. 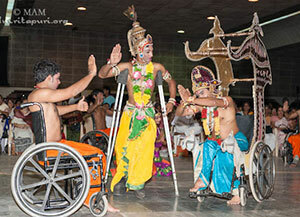 Amma did not forget the other four-legged ashram residents, the elephants Ram and Lakshmi. 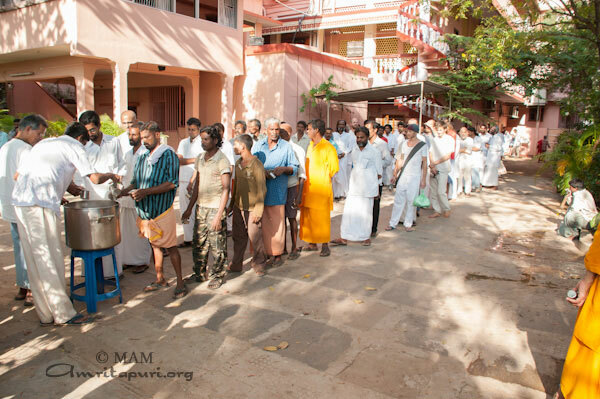 Besides her room, Amma lovingly fed them with jaggery-rice balls, bananas and biscuits. 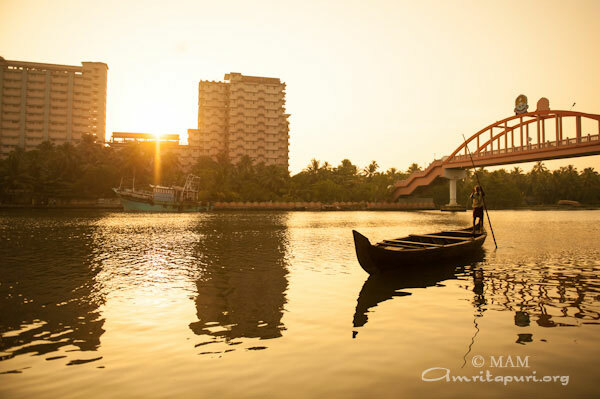 At least some might have felt that the two and half hours was something like that of Onam. Amma’s mere presence brings so much happiness, let alone such festivities. 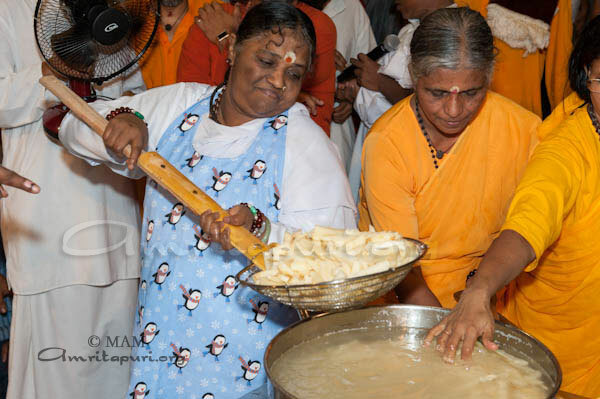 In less than 8 hours after the dosa fest, Amma left for her Japan American Yatra. 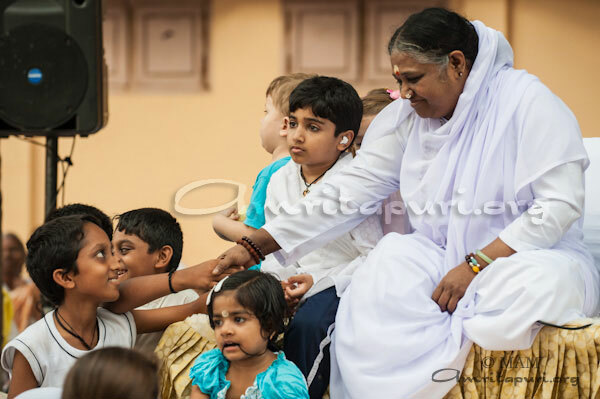 A few days ago, Amma had indicated that she would stay with her children at the swimming pool. 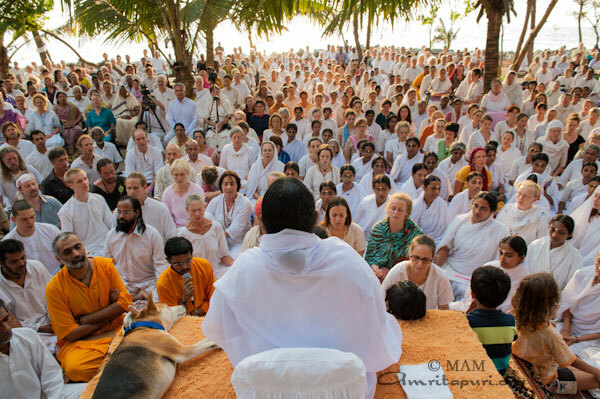 The Darshan on Thursday finished late at 6:30 am after Amma having sat 21 hours, on Friday. 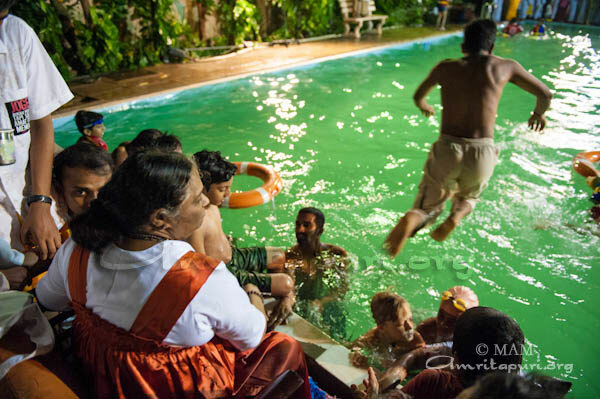 So few assumed Amma would come to the pool. 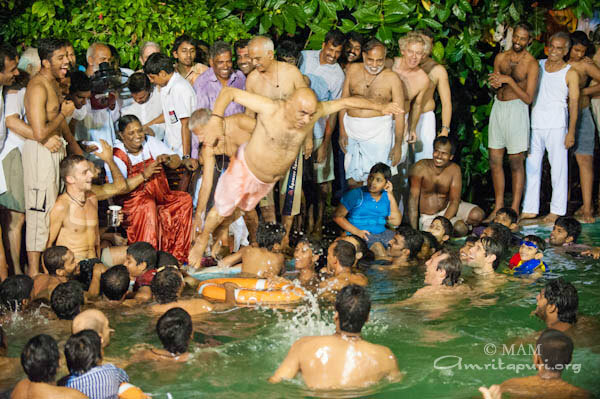 But just after Bhajans, around 8:30 pm, Amma came to the swimming pool. The first session was with the girls and the second was with the boys. 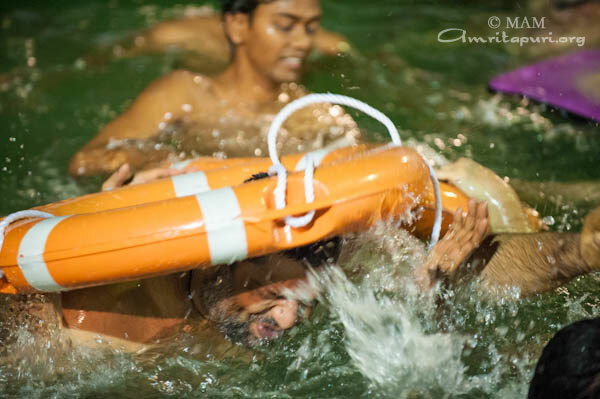 Sitting at the deep-end of the pool, Amma would push swimmers into the water after spending a loving few seconds with each one. To some, she would ask if they knew swimming. 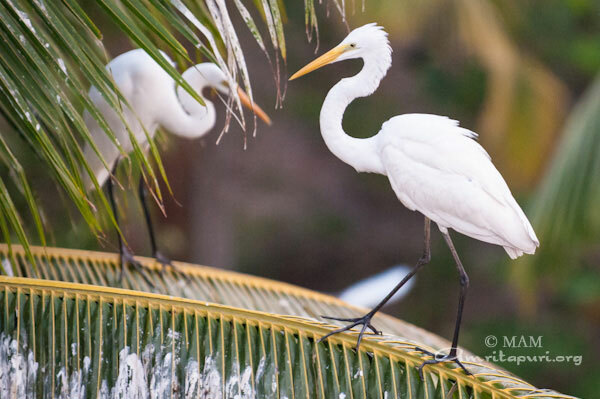 To others, it varied from jokes to spiritual insights. 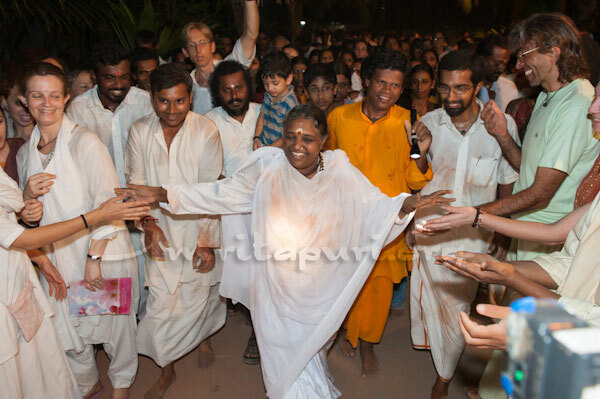 Amma would cheer like a little child as she would receive a splash of water. For every person, she checked if they knew swimming, would ask for the protective ring and would ask trained swimmers to hold as she would nudge them lovingly. 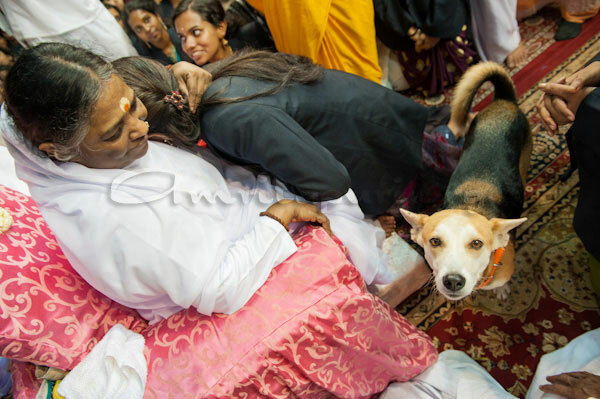 Even some senior Swamis dived getting a loving nudge from Amma. The whole swimming pool area was surrounded by smiling faces. 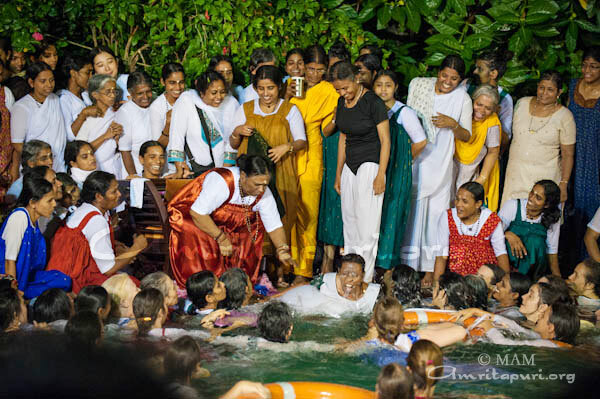 At the end Amma sang a bhajan “He giridhara gopala.” She asked all to take a dip in the pool chanting “Ma” and come up with chanting “Om”. 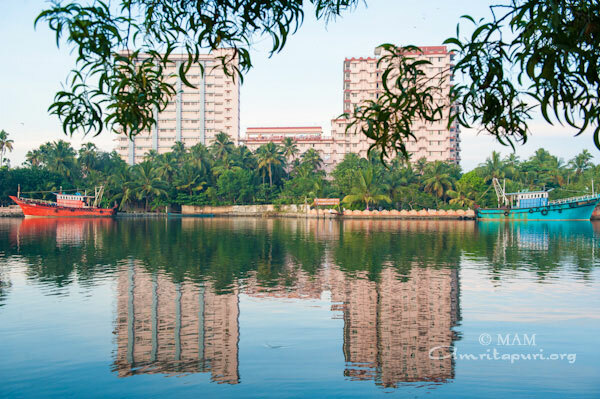 Amma left the pool at quarter-past eleven, she touched everyone as she walked. Ashram elephants, Ram and Lakshmi even enjoyed the thrill as Amma fed them on her way back to the room. Integrated Amrita Meditation Technique (IAM Technique) courses were held for prisoners serving sentences at the Direzione Casa Cirdondariale du Udine, a penitentiary for men in Udine, Friuli Venezia Giulia, Italy. 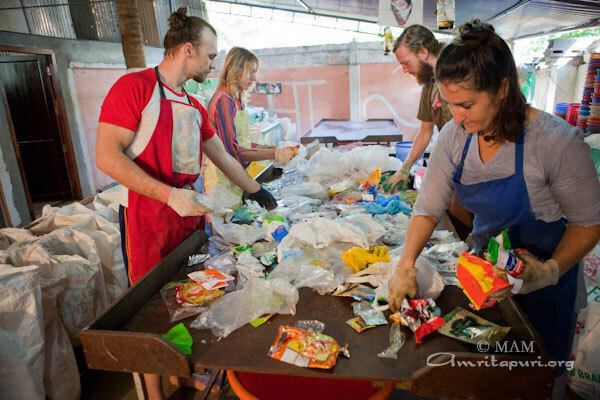 A total of 14 inmates, ages 30 to 60, participated in the sessions, which were voluntary. “At first they were very skeptical about the claims we made about IAM’s power to relax the mind and other positive techniques. 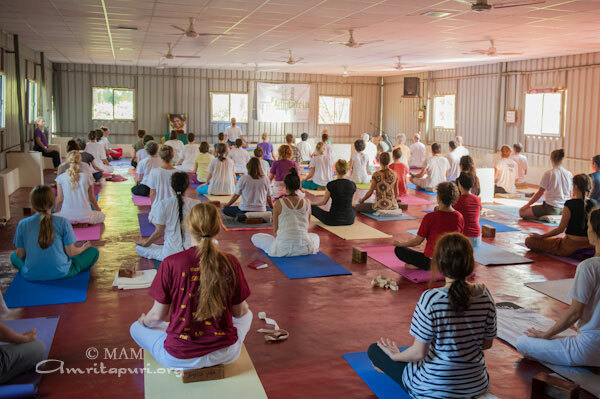 Yet, by the end of the course, they were amazed and admitted that they did indeed feel peace and relaxation,” said Marina Ghezzi, one of the instructors. Tiziano said he was deeply moved by the number of questions about the positive effects of meditation the inmates asked to the instructors. “I was also struck by the fact that two inmates who had taken part in the first course asked to be admitted also into the second course, in the afternoon,” said Tiziano. 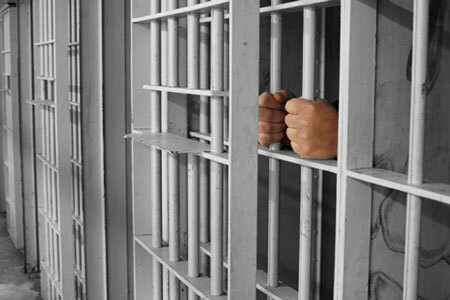 Future classes for inmates, as well as classes for prison staff are in the process of being planned. 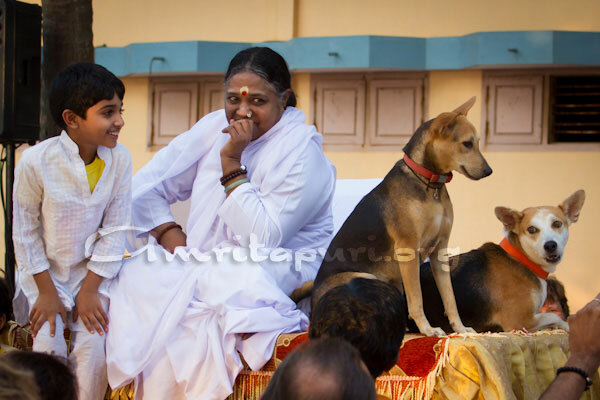 Photos of Ashram surroundings, Amma, ashram dogs Tumban & Bhakti, Amma with Vechur cow, recycling center and Shivaratri celebrations from the month of February 2012. 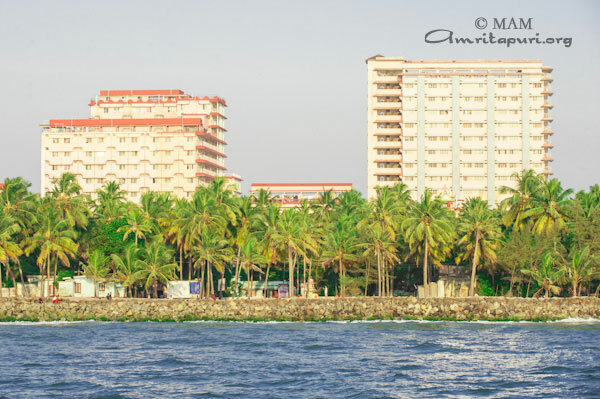 Some photos of Amritapuri Ashram, Amma, Ashram life and surroundings from the month of January 2012.